So expensive in terms of what we got, basic hotel only to sleep, breakfast was very poor, Eggs were not well cooked! Coffee tastes bad! Not worthy the 177€ we paid for 1 night! location close to my business place nice staff having a restaurant for the evening. Was OK, but surely not a grande cuisine. room was OK nothing outstanding. The bed was ok, the room was ok. The windows were on the very busy motorway, but no noise as one could expect. Windows are soundproof. I arrived quite late and the reception was very friendly. Enjoyed short night, large bathroom. Gluten-free breakfast with espreeso was excellent! And enjoy very kind staffs and clean air with learning the location! Ramada Brussels Woluwe is exactly between the center of the city and Brussels Airport, a 15-minute drive from both. It features a 24-hour front desk, car rental service and tour desk. All of the soundproof rooms and studios at Ramada Woluwe are air-conditioned and come with satellite TV, a work desk and a safe. Guests can enjoy a buffet breakfast in the dining room which features panoramic views of Brussels. The NATO Headquarters are a 10-minute drive from the hotel. Diamant Metro Station is less than a 20-minute walk away. The 79 bus service departs across from the hotel and goes direct to the European Parliament every 15 minutes. Sint-Lambrechts-Woluwe / Woluwe-Saint-Lambert is a great choice for travelers interested in shopping, restaurants and atmosphere. 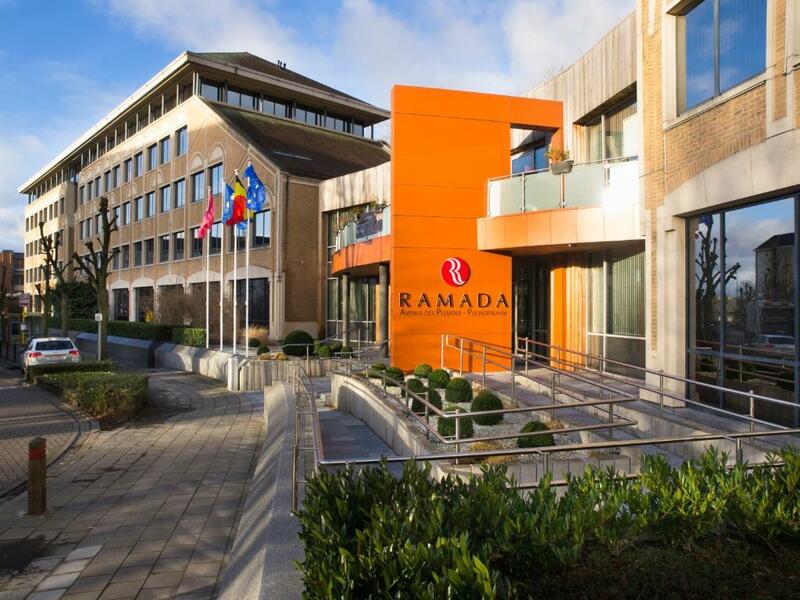 When would you like to stay at Hotel Ramada Brussels Woluwe? An elegantly decorated room with a modern bathroom. It comes with air conditioning, flat-screen satellite TV and a desk. This spacious room has a separate toilet and bathroom. This studio includes a kitchenette. An elegantly decorated room with a modern bathroom. It comes with air conditioning, flat-screen satellite TV and a desk. Please note that this room cannot accommodate an extra bed. Spacious room with a seating area and a modern bathroom. It comes with 2 single beds and a sofa bed. Please note that the maximum occupancy is 2 Adults + 2 Children or 4 Adults (see Extra Bed Rates). Please note that the 4th person will share the double bed. House Rules Hotel Ramada Brussels Woluwe takes special requests – add in the next step! Hotel Ramada Brussels Woluwe accepts these cards and reserves the right to temporarily hold an amount prior to arrival. Please note that reservations should be guaranteed with a valid credit card, except the reservations for arrival on the same day. Guests can make use of the parking at Clos du Lynx 5, 1200 Brussels. Please contact the hotel to receive an access map. There is another parking area at Gulledelle. When using a GPS system type in Gulledelle as street and enter 1200 Brussels as City. Please note that the special price reduction of the multiple nights is only valid if the guests stay the booked nights. When booking the nights for the reduced tariff, the full payment needs to be made in advance. Everything was OK except for the morose receptionist who was in charge on 20th April evening. The air conditioner was started by itself to cool the room to 16 degrees when we entered the room in the evening. I used the remote control to heat the room a bit, but the "mode" button of the remote control of the air conditioner was broken off and I could not heat the room and turned it off. But the air conditioner continuesly started itself. So I brought the remote control to the morose receptionist. She said at first: "Why did you touch the remote control." I could not say a word to this stupid question. Well why did you put the remote control in the room if you don't want people to touch it? And what will the people do if the they want to cool the room WITHOUT TOUCHIN the remote control. Well I wanted the remote control back in case the air conditioner will start itself. Bu she DIDN'T give me the remote control back insistently. Weird! She said that she was going to send someone to our room to fix it but noone came into our room. The facility was OK except for that morose woman who doesn't even look in your eyes while talking. I don't know her name. There were two woman on 20th evening there. She waa the older one. Very close to Brussel centrum. Far from the touristic area. The shower outlet in the bathroom was clogging and the price of the room was quite high. Both the room and the bathroom were very spacy. The bed was superb, the airconditioning was silent and the room temperature was just the right one. I really had a good night sleep in this room. The bus station is right in front of the hotel. Very poor quality bed. Frame was damaged which resulted in it moving excessively and mattresses was excessively soft. Shower curtain was poor and the whole bathroom floor became flooded. Friendly staff. Large rooms. Despite being next to a major highway, the rooms were very quiet. Wifi was great, I was able to stream Netflix with no problem. The hotel is a bit remotely located. The breakfast has ups and downs. Some topics are nice but several things create an awful amount of plastic waste. The coffee is below average and seems to be powder coffee. The room was clean and quite big. The front side is quite silent. When I arrived there was parking available, but the amount of spots looks very limited. The parking is terrible, If you come by car, do not even think to book this hotel. The parking location is at the back of the property, and you need to go more than 3 kilometers to go to the back of the same building. Yes 3 Km. because all the streets next the hotel are either one way or only pedesterian. There is not enough free parking space in front of the hotel. If you come by taxi or bus, It is OK. There is no minibar in the rooms. Not even one bottle of water. No kettle for coffea or hot water. Location was good, the room was clean. Breakfast was satisfactory. The staff was kind. Lady at desk was not friendly. I prebooked via Booking and both mye and my colleugue where already deducted from my Creditcard. We would like seperate bills and payments but she wasn't even willing to have a look at all. No service just short answers and robot like way of handling the checkin. A shower with no shower curtain. Room 226 Being told there are only 5 rooms with double beds in, even thought that is what I requested when I booked it.